paint with white whereever you DON’T want to displace. Hi Vusta thank you very much for this I really appreciate. Could you send the file in 2016 format? I use 2016. Thanks a lot! here’s 2016. I’ve painted it correctly this time. In the Displacemod, my amount is -4, if you want the displace to go other way, simply negate it and make it 4. Thank you so much for the conversion. I figured the problem I am having. 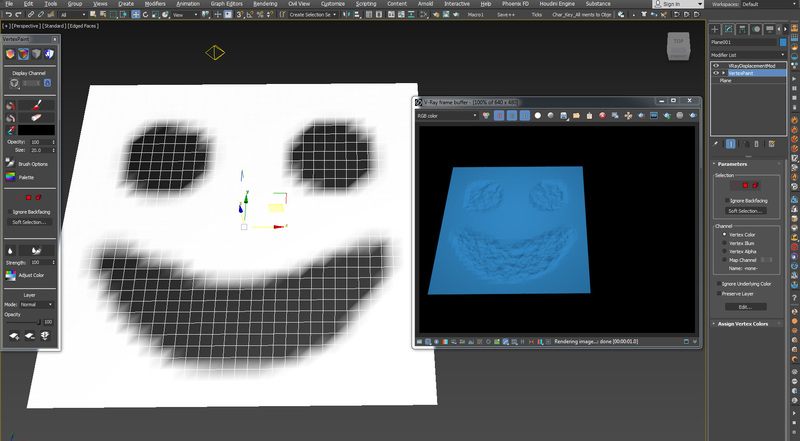 I wasnt using the 3dmap under displacement. Fixed it! Simplest way for masking is to use “mask” map and put vert. col. in mask slot. pic CLEARLY shows displacement in some areas, completely flat in others…that is NOT everywhere to my eyes.